The rugged Military model has seen extended duty on several fronts over the years and is now a prize for military enthusiasts throughout the world. This highly unusual motorcycle is painted olive drab and comes standard with metal panniers (saddle bags) and engine bars, a unique look that harkens back to World War II. 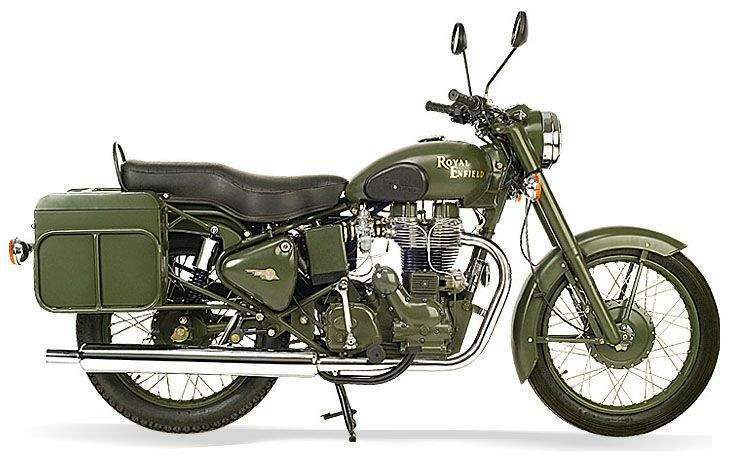 Royal Enfield has a long and illustrious association with the British and Indian armies. In 1892 the company's predecessor won a lucrative contract to supply precision rifle parts to the Royal Small Arms Factory in Enfield, Middlesex and to celebrate produced a bicycle called the 'Enfield'. When motorcycle manufacturing commenced in 1901, the Royal Enfield was born. During The First World War Royal Enfield supplied motorcycles to the British War Department, including a machine gun combination and the 6hp stretcher-carrying outfit. However the company’s most famous military motorcycle is possibly the ‘Flying Flea’ that was developed for airbourne forces in the later stages of the Second World War. Sometimes referred to as the ‘Airborne’, this lightweight 125cc motorcycle could be fitted into a steel tubular cage called the ‘Bird Cage’, which had a parachute attached to it and so could be dropped by parachute with airborne troops. Royal Enfield opened a plant in Madras in 1949 to supply motorcycles to the Indian army. Since then the plant has supplied over 100,000 machines to the Indian army and a further 25,000 to the Police. 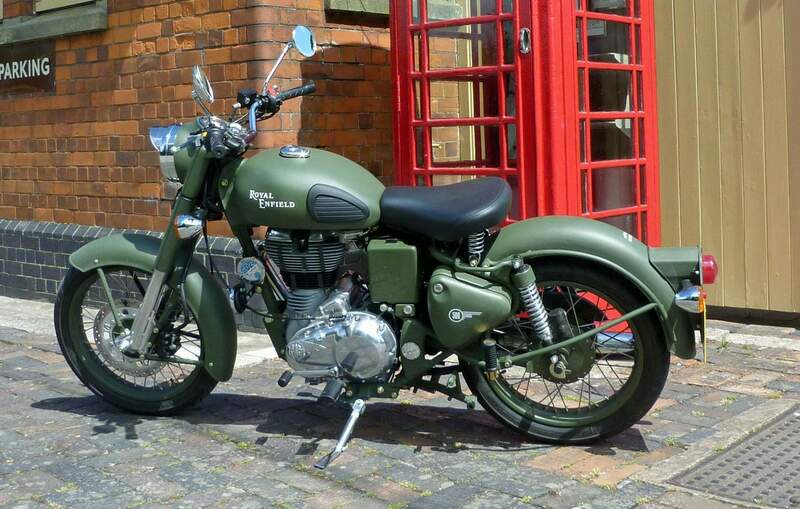 The current Army specification Royal Enfield looks almost identical to the original 350cc Bullet of 1949 at first glance, but is fitted with many discreet modern conveniences, including a 5-speed gearbox, electric starter and 12-volt electrics. However, a classic 500cc single cylinder engine with an authentic exhaust note powers it. These machines are painted olive green (including the mudguards and engine casings) and fitted with a heavy-duty rack with “ammo box” panniers and crash bars, as supplied to the Indian Army. It complies with all current European regulations so it is fully road legal and is available via Royal Enfield's nationwide dealer network.